The Church in this instance is not the body of believers that comprise the universal Christian Ekklēsia, but the angelic singer called Charlotte, who took to the streets of Cardiff with a cardboard placard proclaiming that she is “mad as hell” at David Cameron’s victory and the election of a Conservative majority. And not only is Ms Church “mad as hell”; she’s “not going to take it any more”. It isn’t quite clear what she means by this sinister threat. Will she re-release Voice of an Angel? Inflict more Tissues and Issues on the world? Duet with Celine Dion? Presumably, by ‘it’ she means ‘Tory cuts’ and austerity. ..ashamed to be English. Ashamed to belong to a country that has clearly identified itself as insular, self-absorbed and apparently caring so little for the most vulnerable people among us. Why did a million people visiting food banks make such a minimal difference? Did we just vote for our own narrow concerns and sod the rest? Maybe that’s why the pollsters got it so badly wrong: we are not so much a nation of shy voters as of ashamed voters, people who want to present to the nice polling man as socially inclusive, but who, in the privacy of the booth, tick the box of our own self-interest. And he goes on to explain why “the people” got it wrong and how Russell Brand “just might have been right” because voting doesn’t make “a blind bit of difference”. Indeed, by voting, the poor “merely give legitimacy to a system that connives with their oppression and alienation”. How do the poor fare under dictatorship, Father Giles? If not dictatorship, what exactly are you proposing we should replace our illusory democracy with? Clericalism? What participatory empowerment of the people is not some form of people power? By what means must we “control the gods of Rothermere and Murdoch”? Spiritual influence? Isn’t the Church obliged to pray for and submit to those in authority, rendering unto Caesar those things that belong to Caesar? Isn’t the mission of the Church to speak truth to power while defending the weak and giving a voice to the oppressed? Bishop Nick Baines has it about right, especially his exhortation “to recognise the will of the people as expressed in the election (although that is more complicated to order under the first-past-the-post system)”. Submit? Did you say “submit to the elected government”? 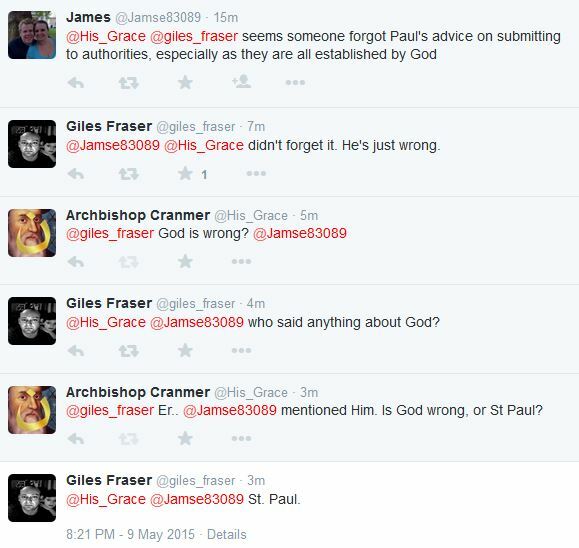 Tsk, Father Giles Fraser is having none of that namby-pamby nonsense. St Paul, you see, was wrong. So, there you have it. One Church is “mad as hell”, and a vicar is as mad as a box of frogs. 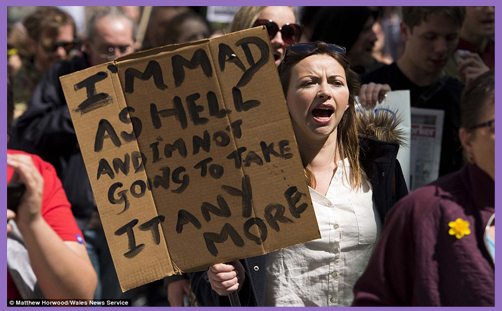 Dissatisfaction or despair at the imperfections of political authority may be a reason for acting without reason, but to rail against democracy is to remonstrate with freedom – the very freedom by which Charlotte Church protests and Father Giles bellyaches. We can expect shallow ‘Champagne Socialists’ like Ms Church to preach about the divine authority of Socialism and the virtues of free agency to incite revolution. But we shouldn’t expect it of the Church. St Paul wrote: ‘Let every soul be subject unto the higher powers. For there is no power but of God: the powers that be are ordained of God. Whosoever therefore resisteth the power, resisteth the ordinance of God: and they that resist shall receive to themselves damnation‘ (Rom 13:1f). The powers (plural) of human society have been instituted by God. ‘All scripture is given by inspiration of God, and is profitable for doctrine, for reproof, for correction, for instruction in righteousness..‘ (2Tim 3:16). But what does it serve to quote Scripture to a priest who knows more than the Apostle Paul?